Associate Professor Kiichi NIITSU has been appointed to Associate Editor of IEEE Transactions on Biomedical Circuits and Systems (IEEE TBioCAS). Associate Professor Kiichi NIITSU has been appointed to Secretary of JSPS 165 Comittee. Matsunaga-san’s & Hayashi-kun’s papers received IEEE/ACM Asia-South Pathific Design Automation Conference (ASP-DAC) 2019 University LSI Design Contest Special Feature Award ! Our research will be introduced on NHK radio (11/09 Fri 18:20-18:30). M1林賢哉君がIEEE BioCAS 2018にてBest Live Demo Awardを受賞しました! 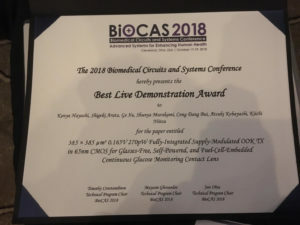 M1 Hayashi-Kun’s paper received “Best Live Demo Award” in IEEE BioCAS 2018 ! Research achievement has been introduced in Newspaper. Hayashi-Kun’s paper is accepted to IEEE BioCAS 2018 ! Kenya Hayashi, Shigeki Arata, Ge Xu, Shunya Murakami, Dang Cong Bui, Takuyoshi Doike, Maya Matsunaga, Atsuki Kobayashi, and Kiichi Niitsu, “A 385um × 385um 0.165 V 0.27 nW Fully-Integrated Supply-Modulated OOK CMOS TX in 65nm CMOS for Glasses-Free, Self-Powered, and Fuel-Cell-Embedded Continuous Glucose Monitoring Contact Lens,” in Proc. IEEE Biomedical Circuits and Systems Conference (BioCAS 2018), Oct. 2018, pp. 1-4. Hayashi-Kun’s paper is accepted to IEEE TCAS-II ! K. Hayashi, S. Arata, S. Murakami, Y. Nishio, A. Kobayashi, and K. Niitsu, “A 6.1nA Fully-Integrated CMOS Supply-Modulated OOK Transmitter in 55nm DDC CMOS for Glass-Free, Self-Powered, and Fuel-Cell-Embedded Continuous Glucose Monitoring Contact Lens,” accepted to IEEE Transactions on Circuits and Systems II (TCAS-II). Associate Prof. Kiichi Niitsu received the IEICE SUEMATSU-YASUHARU Award. Kobayashi-Kun received IEEE Nagoya Section excellent student award ! Atsuki Kobayashi, Yuya Nishio, Kenya Hayashi, Kazuo Nakazato, and Kiichi Niitsu, “A 350-mV, Under-200-ppm Allan Deviation Floor Gate-Leakage-Based Timer Using an Amplifier-Less Replica-Bias Switching Technique in 55-nm DDC CMOS,” in Proc. IEEE Custom Integrated Circuit Conference (CICC 2018), Apr. 2018.
in Proc. IEEE Biomedical Circuits and Systems Conference (BioCAS 2016), Oct. 2016, pp. 148-151. K. Gamo, K. Nakazato, and K. Niitsu, “Current-Integration-Based CMOS Amperometric Sensor with 1.2 μm × 2.05 μm Electroless-Plated Microelectrode Array for High-Sensitivity Bacteria Counting,” in Proc. ACM/IEEE Asia and South Pacific Design Automation Conference (ASP-DAC 2017), Jan. 2017. K. Ikeda, A. Kobayashi, K. Nakazato, and K. Niitsu, “Scalable Time-Domain Biosensor Array for High-Resolution and Large-Scale Bio-Imaging,” in Proc. ACM/IEEE Asia and South Pacific Design Automation Conference (ASP-DAC 2017), Jan. 2017. A. Kobayashi, K. Ikeda, Y. Ogawa, M. Nishizawa, K. Nakazato, and K. Niitsu、”Design of an Energy-Autonomous Bio-Sensing System Using a Biofuel Cell and 0.19V 53µW Integrated Supply-Sensing Sensor with a Supply-Insensitive Temperature Sensor and Inductive-Coupling Transmitter,” in Proc. ACM/IEEE Asia and South Pacific Design Automation Conference (ASP-DAC 2017), Jan. 2017. K. Niitsu, S. Ota, K. Gamo, H. Kondo, M. Hori, and K. Nakazato, “Development of Microelectrode Arrays Using Electroless Plating for CMOS-Based Direct Counting of Bacterial and HeLa Cells,” IEEE Transactions on Biomedical Circuits and Systems, vol. 9, no. 5, pp. 607-619, Nov. 2015. Kohei Gamo, Kiichi Niitsu, and Kazuo Nakazato, “A CMOS Current Integrator with 1.2um × 2.05um Electroless-Plated 1024 × 1024 Microelectrode Array for High-Sensitivity Bacteria Detection,” accepted to International Conf. on Molecular Electronics and Bioelectronics, Jun. 2015. Suiki Tanaka, Kiichi Niitsu, and Kazuo Nakazato, “An Inverter-Based CMOS Level-Crossing ADC for Low-Power Biosensing,” accepted to International Conf. on Molecular Electronics and Bioelectronics, Jun. 2015. Kiichi Niitsu, Kohei Yoshida and Kazuo Nakazato, “A Low-Power CMOS Magnetic Cell Manipulation Platform Using Charge Recycling Technique,” accepted to International Conf. on Molecular Electronics and Bioelectronics, Jun. 2015. Keita Muto, Kiichi Niitsu, and Kazuo Nakazato, “A 1.8V-Input-Range Voltage-to-Current Converter Using Source Degeneration for Low-Noise Multimodal CMOS Biosensor Array,” accepted to International Conf. on Molecular Electronics and Bioelectronics, Jun. 2015. Yuuki Yamaji, Kiichi Niitsu, and Kazuo Nakazato, “A Low-Voltage High-Resolution CMOS Electrophoresis Platform with 32×32 Sample/Hold Cell Array,” accepted to International Conf. on Molecular Electronics and Bioelectronics, Jun. 2015. Kiichi Niitsu and Kazuo Nakazato, “Non-optical Frequency-Shift Based Testing of Electrode Formation Using LC-VCO for High-Reliability CMOS Biosensor Array ,” accepted to International Conf. on Molecular Electronics and Bioelectronics, Jun. 2015. Kiichi Niitsu and Kazuo Nakazato, “[Invited] CMOS Platforms for Biomedical Application -DNA Sequencing, Glucose Detection, and Bacteria Counting-,” in Proc. International Conference on Integrated Circuits, Design, and Verification (ICDV 2014), Nov. 2014 (6 pages). Hayato Komori, Kiichi Niitsu, Junko Tanaka, Yu Ishige, Masao Kamahori, and Kazuo Nakazato, “An Extended-Gate CMOS Sensor Array with Enzyme-Immobilized Microbeads for Redox-Potential Glucose Detection,” in Proc. IEEE Biomedical Circuits and Systems Conference (BioCAS 2014), Oct. 2014, pp. 464-467. Shoko Ota, Kiichi Niitsu, Hiroki Kondo, Masaru Hori, and Kazuo Nakazato, “A CMOS Sensor Platform with 1.2 µm × 2.05 µm Electroless-Plated 1024 × 1024 Microelectrode Array for High-Sensitivity Rapid Direct Bacteria Counting,” in Proc. IEEE Biomedical Circuits and Systems Conference (BioCAS 2014), Oct. 2014, pp. 460-463. Masayuki Takihi, Kiichi Niitsu, and Kazuo Nakazato, “Charge-Conserved Analog-to-Time Converter for a Large-Scale CMOS Bionsensor Array,” in Proc. IEEE Int. Symp. on Circuits and Systems (ISCAS 2014), Jun. 2014, pp. 33-36.